Everybody loves a picnic. Summer is picnic season. This weekend we have our parish picnic over yonder on the green grass at Patriarch Park. Food, fun, fellowship. If there’s one thing that Catholics are good at it’s eating. Maybe I should speak for myself but the picnic is sure to provide a good time for all. A bishop once put the question to me: what does Jesus do when he’s not working, raising the dead, curing the sick, dispelling devils? I said, I know that he liked to hike. He had a day job, carpentry, so that kept him busy. But when Jesus wasn’t working he was doing what many of us like to do in spare time: dining with friends. Jesus was a hearty eater but he walked a lot and that helped him to keep his weight down. One scriptural heavyweight, the prophet Elisha, fed many starving people by the power of God. Elisha’s sign among the people is fulfilled in Jesus’s of the five-thousand. God opens his hands to satisfy our needs, claims the psalmist. Through the providence of God we form one great body of Christ. For the next four Sundays during the Liturgy of the Word we will hear selections from the Gospel According to John. We are in the second year of the three-year lectionary cycle—the Year of Saint Mark. The lectionary as we know it was crafted during the Second Vatican Council (1962-65). Prior to the council the church utilized a one-year reading format. As you can imagine the old book of readings significantly reduced the opportunity for Joe Six-Pew to reverence the Word of God. What we have now for the Liturgy of the Word is a three-year “semi-continuous” reading of the scriptures, so that the treasures of the Bible are opened to the minds and hearts of the faithful in abundance. Let no one say that Catholics aren’t familiar with the Bible, because Sunday worship serves a heaping helping of the Word of God, comprising about ninety percent (90%) of the Sacred Page. We must not be passive listeners. The Word of God is a lived and shared experience. We have to give it away in order to keep it. Mark’s gospel is the shortest, fourteen chapters, and was the first gospel to be written, composed about AD 60. Because Mark is short it is necessary to augment certain Sundays in the middle of Ordinary Time. To do this the church includes passages from the Gospel According to John, John, which is generally reserved for the special seasons of Christmas and Easter. That’s a little warm up with the Liturgy of the Word, the first half of the Mass. Here now is an attempt to break up the Liturgy of the Eucharist, the second half of the Mass. Our time with John begins with the miraculous feeding of several thousand people on a patch of grass with the Jewish celebration of Passover to be held about that time. 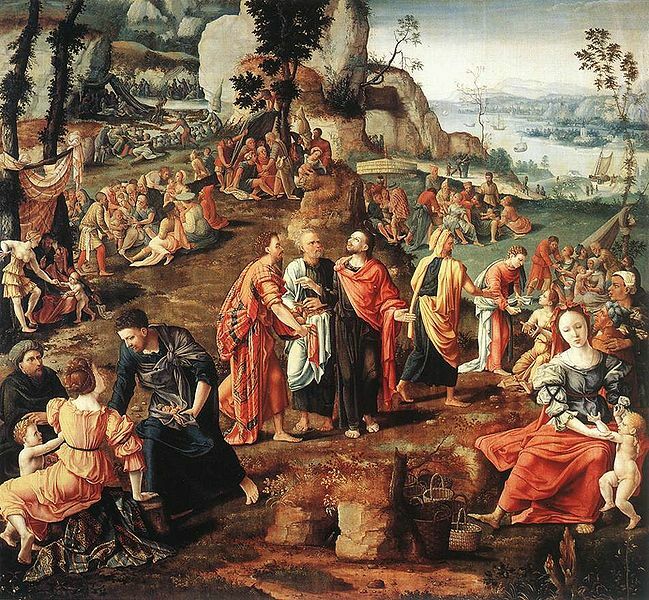 The story of the feeding of the five-thousand (5,000) unfolds in Johanine splendor into the most important writing in the entire canon of scripture: the Bread of Life Sermon. John did not include an institution narrative in his rendition of the Last Supper. Rather, he presents Jesus for who and what he is: the bread of life. What makes the story of the feeding of the five-thousand (5,000) so remarkable is that it is an introduction to the Eucharist. The gospel is both Jewish and Christian and it is the Lord who bridges the gap, fills in empty spaces, affirms the great truth of the world: that God is one and there is no other god like him. With the Eucharist there is no more divisiveness in the Church because Christ can’t be divided. Paul put this question to the Corinthian church, a community that didn’t necessarily “play well with others.” Paul reminds the Corinthians that, though they form an individual community, we are universal, every day, all day, on every continent, in every language, until the end of time. To start, let us set the scene. Jesus is near his hometown, near the Sea of Galilee. Everybody wants a piece of him. They witness his miracles, listen to his words, and watch as he heals the sick. They ain’t seen nothing yet. On the mountain, a typical setting for Jesus, where he spends time alone in prayer to his Father, he sits with the authority of Moses, his predecessor who led his people from slavery to freedom with help from the hand of God. Because Passover was near—which is why John includes the detail of a field of grass, meaning it was springtime—many pilgrims headed toward Jerusalem wanted a piece of Jesus, to experience the man in full. Jesus is ignorant of nothing: he played dumb so that he could test the resolve and the faith of his disciples. A boy appeared with two fishes and five barley loaves; barley was the food of the poor. Tens of thousands of pilgrims in a field following a miracle man wanted to eat but none of them brought any food. Maybe they expected Jesus to whip up a meal for them on the fly. Or, so spellbound were they by the words and actions of the God-Man they scarcely bothered to think about collation. For Christ this moment was more than a picnic. He seized the moment to teach his disciples and the pilgrims a lesson they would never forget—and neither would we. Here’s where the story turns into a prefigure of the Roman Catholic Mass. “Jesus took the loaves, gave thanks, and distributed to those who were reclining. … When they had had their fill, he said to the disciples, ‘Gather up the fragments left over so that nothing will be wasted’.” (Jn 6:12). During the Mass the priest blessed the gifts and offers thanksgiving to God. Provisions are then stored in the tabernacle for those who are unable to attend Sunday worship. We hear the stories; we break the bread; we stand in solidarity with the Church throughout the world. One bread, one body, one Spirit, one baptism, one Lord over all. In a way the disciples didn’t really understand who Jesus was and what he was about. They tried to “carry him off to make him king,” but that wasn’t going to happen. Later in the story of John Jesus tells Pontius Pilate, “My kingdom does not belong to this world” (Jn 18:36). All this took place that the scriptures might be fulfilled, so that the words of the prophet Elisha might not be in vain. “Give it to the people to eat. For thus says the Lord: ‘They shall eat and there shall be some left over.’ And when they had eaten, there was some left over, as the Lord had said.” (2 Kgs 4:44) .